A figure skater has a mass of 40 kg and her partner's mass is 50 kg. She pushes against the ice with a force of 120 N, causing her and her partner to move forward. Calculate the pair’s acceleration. Assume that all forces opposing the motion, such as friction and air resistance, total 5.0 N.
This is College Physics Answers with Shaun Dychko. 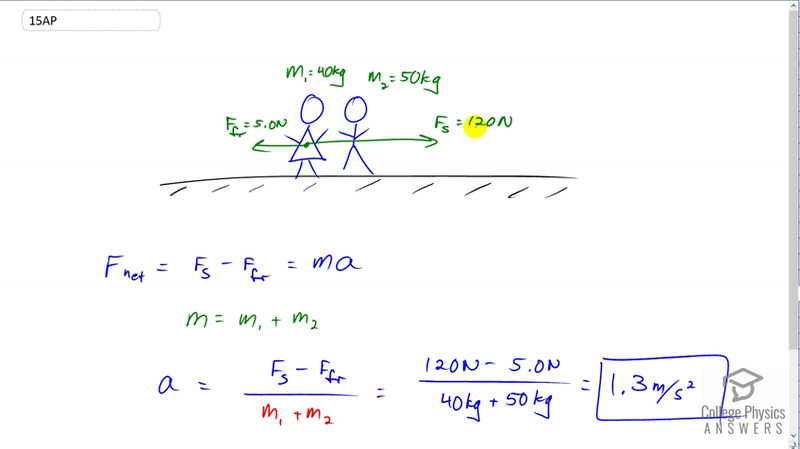 One of these figure skaters with mass 40 kilograms pushes the pair of them forward with a force of 120 Newtons and there is a total force of friction of five Newtons going the other way. The system that's accelerating is this pair of skaters. So this total mass is what we're going to have in our, in that force formula and that mass is going to be m one plus m two. It's going to be 90 kilograms. So we have the force to the right, force due to the skater minus the force of friction to the left is the net force and so that is mass times acceleration. We'll divide both sides by a, sorry both sides by m I should say, to solve for a. So we get force of the skater minus the force of friction, divided by m but m is m one plus m two and so we'll substitute that in place of m. So we have 120 Newtons minus 5 over 90 kilograms which gives 1.3 meters per second squared will be the pair's acceleration.